Description: Blue Tourmaline Slice, solution etched termination face up. Back lighted with daylight bulb. Size: Slice measures 2.1 cm x 2.3 cm x 7 mm thick, 35.3 carats. Origin: Mined at Mt. Marie, gem crystal found in Abby’s wedding Pocket, June 26, 2009. 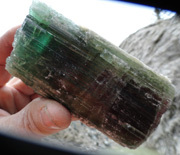 Description: Gemmy watermelon tourmaline slice with a green tourmaline running through the middle of this one-of-a-kind specimen. The burgundy core abruptly changes to a thin vibrant pink zone just inside the green rind. Back lighted with daylight bulb. 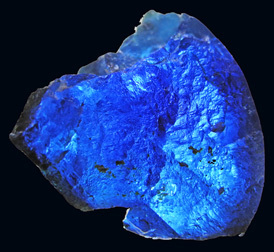 Size: Specimen is 3.1 cm x 2.9 cm x 10.1 mm thick, 89.7 carats. 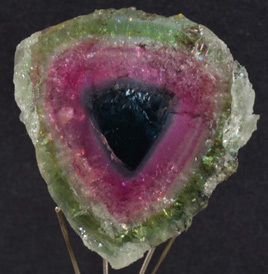 Description: Gemmy tourmaline slice showing sharp contrasting color zones of green, pink, and blue. Dimly back lighted with daylight bulb. Front side is polished; Rear side has visible fractures and is stabilized and rough sanded. Size: Slice measures 2.3 cm x 2.0 cm x 4mm thick, 22 carats. 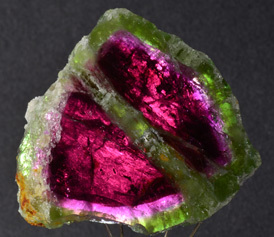 Description: Gemmy watermelon Tourmaline Slice showing contrasting color zones of green, pink, and burgundy. Dimly back lighted with daylight bulb. 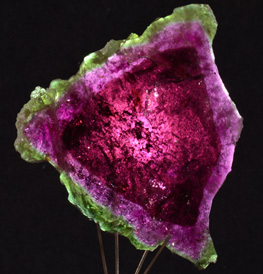 Size: Specimen is 3.9 cm x 3.3 cm x 5.5 mm thick, 66 carats. Origin: Mined at Mt. Marie, Maine, found in the Veteran’s Day Pockets, Nov. 11, 2011. 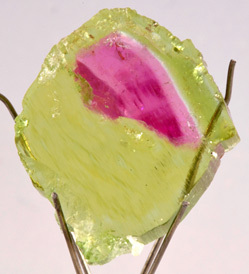 Description: Gemmy watermelon tourmaline slice, unusual yellow green with elongated off-center gemmy pink core. Size: Specimen is 1.9 cm x 1.6 cm x 4.7 mm thick, 14.4 carats. Origin: Mined at Mt. Marie, Maine, found in the New Day Pocket, Oct. 16, 2011.